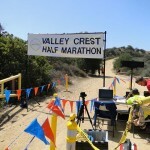 The Rabbit Valley Half Marathon is a fun, rugged, desert run as an out and back mostly on the Kokopelli Trail. Runners will enjoy 13.1 miles of gorgeous early season desert with short steep climbs, rock gardens and sand traps. How to Find Start Line: From I-70, take Exit 2 for Rabbit Valley (about 17 miles west of Fruita). Turn South, drive along the overpass and continue about 1/2 mile past the large staging area Turn left into the next parking area where there are restroom facilities. Nearest Parking: Turn left into the next parking area where there are restroom facilities.